Last month, more than 400 Civil War Trust members and guests descended on Chattanooga, Tennessee for our 18th annual conference. Conference attendees had the option of 15 different tours with top tier battlefield guides across 4 days. 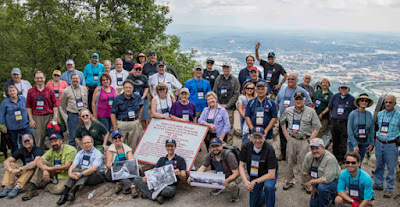 The tours incorporated a detailed overview of the battles of Chickamauga and Chattanooga, and included visits to places like Orchard Knob, Snodgrass Hill, Lookout Mountain, and Brown’s Ferry -- sites that you helped to preserve! Other highlights included lectures from noted historians, an evening riverboat cruise along the Tennessee River, and the unveiling of a new book that details our 30 year organizational history. If you’ve had the chance to attend one of our conferences, you know how much our members enjoy being out on the battlefield, discussing our nation’s history with experts and, most of all, spending time with like-minded people who care passionately about preserving American history. If you’d like to join us in Newport News, Virginia in 2018, mark your calendars for Marching Toward Freedom: The Wars of America’s First Century in Virginia’s Historic Triangle. Online registration will be open by August 15. On July 5, the Civil War Trust hosted an event on the Antietam Battlefield with U.S. Secretary of the Interior Ryan Zinke. Secretary Zinke announced that President Trump's first quarter salary donation would benefit restoration projects at Antietam. He also announced $7.2 million in federal matching grants to preserve battlefield lands associated with the American Revolution, War of 1812 and Civil War. We recently launched a new and improved site at www.civilwar.org. The new site is designed to help you easily access the information you seek from any device mobile phone, tablet, desktop and to find relevant content on America’s early wars and the preservation of its battlefields.